Jason Concepcion: The thing about the Warriors that separates them from other great regular-season teams of recent memory is how, when they’re clicking (which is frighteningly often), the traditional rules of what constitutes good and bad basketball don’t really apply to them. This is what gives their runs that quasi-magical, who-fucked-with-the-video-game-settings feel. Watching the Warriors when they transcend this mortal plane into that dreams-made-real zone is like discovering an alternate dimension where drugs are actually good for you. 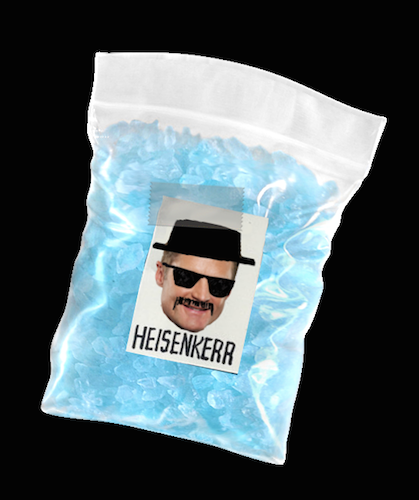 It’s like a galloping basketball version of Heisenberg blue meth. For example: With about seven minutes to go in the second quarter, Houston’s Corey Brewer went in for a layup to push the Rockets lead to 16. Andrew Bogut had just picked up his third foul a minute earlier, sending him to the bench. Dwight Howard and Josh Smith were bullying the Dubs’ frontline. Draymond Green came in to play center, and Harrison Barnes came in for Festus Ezeli. The Warriors, as they have all season, trotted out a lineup made up of a bunch of dudes between 6-foot-3 and Green’s not-exactly-towering 6-foot-7. In 1975, or 1985, or 1995, or 2005, this would be deemed foolish at best, suicidal at worst. Cute team; no way they could win it all. Sure, maybe you’d score like that — shouts to the Phoenix Suns — but you certainly wouldn’t be able to defend legit size. This is 2015, though, and the Warriors do the wrong thing right. It’s stuff like taking a small team, made up of similar-size guys, and causing chaos by switching on defense — a tactic that, in lesser hands, simply abets defensive laziness. Steph Curry, Klay Thompson, Shaun Livingston, Harrison Barnes, and Draymond Green; this lineup played only 27 minutes in the regular season, per NBA.com, in which they put up a 38.1 net rating (130.2 offensive rating, 92.1 defensive rating). 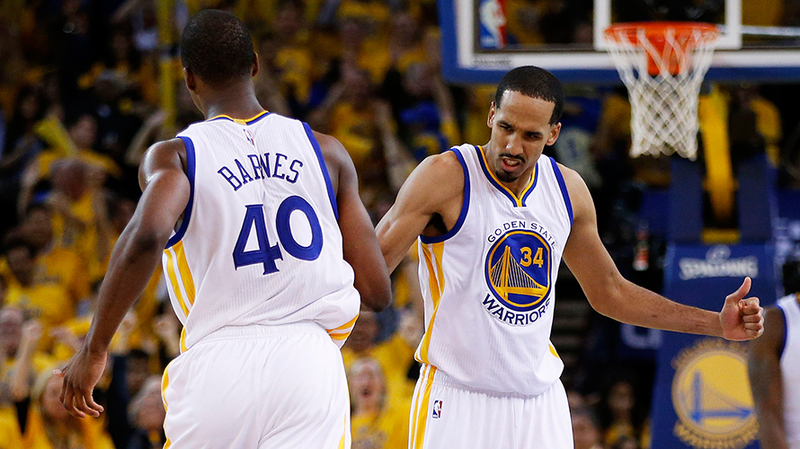 Five minutes after Barnes came in for Ezeli, the Warriors had gone from down 14 to up by one. Another thing that shouldn’t work: scoring point guards who dribble a lot and pull up from long range like Curry did to close out the first half when he brought the ball up, tap-danced on Clint Capela’s spirit, then stepped back from 20 and dropped two in his eye. Is This the Maddest Steph Has Ever Been? Kirk Goldsberry: Instead of James Harden or Dwight Howard, the Rockets sent out Nick Johnson for the ceremonial pre-series handshake. Steph didn’t find that funny. Don’t poke the teddy bear. But I have never seen Jeff Green make a shot while I have been watching one of his games. I leave the room, he is Mr. Nothing But Net. I come back, he’s Old Ironsides. We’re like two ships passing in the night, and he is sailing right past the rim and off the backboard. When it comes to Jeff Green and making shots, I am doing the opposite of bearing witness. Why tell you this deeply personal anecdote? Because Trevor Ariza is the opposite of Jeff Green. I cannot remember the last time I saw Ariza miss. I know he does — but not much. He’s shooting almost 54 percent from 3 over his last five games. He makes Kyle Korver look like Charlie Villanueva. Whenever I am watching, he is the reincarnation of Ricky Pierce, with the wingspan of a wandering albatross and the thieving instincts of Danny Ocean. Is Trevor Ariza the best basketball player alive? All I know is that he’s passing the eye test. 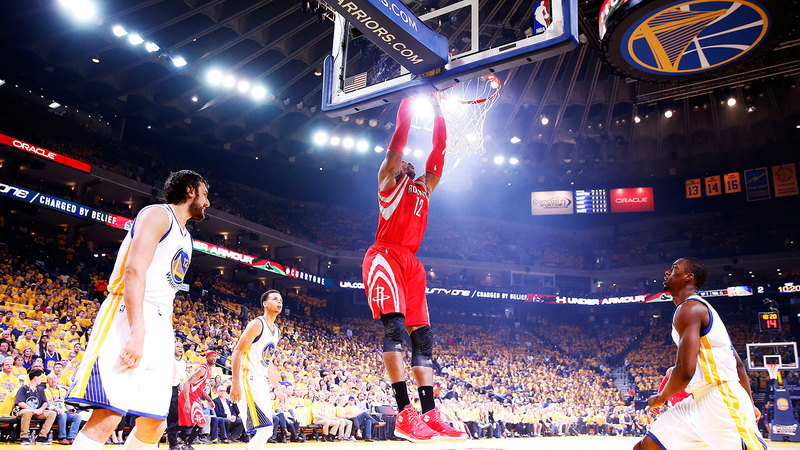 Danny Chau: We were just reacquainting ourselves with Dwight Howard, defensive fulcrum. Never mind his personality, his antics, or his contributions to the degradation of this pure sport — the last three games of the Clippers series reintroduced us to the player who came in second in the 2011 MVP race but probably should have won it. In those three consecutive series-changing victories after being down 3-1 against the Clippers, Howard obliterated opponents who challenged him, allowing for only 35.5 percent accuracy at the rim — an 18 percent decline from what the Clippers normally convert at from that range. Great defensive players have an aura. Dwight had the entire painted area glowing crimson by the end of the second round. The Warriors scored 110 points last night, with 50 of those coming from within the painted area. Those two figures are almost exactly the Warriors’ per-game averages in the respective categories during the regular season. They escaped with a four-point victory, largely buoyed by Stephen Curry’s 6-for-11 from 3. Business as usual. But, staring at the final score, it’s hard not to wonder how things might’ve been different had Josh Smith not fallen into the side of Dwight Howard’s left knee midway through the first quarter. Houston was plus-14 in points in the paint at the end of a first quarter in which Golden State managed only six. But in the ensuing three quarters, the Warriors scored 44 in the paint, and they lost the battle down there by only two points. A Dwight that had confidence in the integrity of his knee would’ve done something about that. Prior to his exit, this average game from the Warriors was on the verge of being decidedly below average. After the game, he sounded optimistic about his chances of playing in Game 2. But it took an Altered Beast transformation from him for the Rockets to overcome the Clippers in seven, and the final score last night wouldn’t have looked so close if James Harden hadn’t put on an offensive display that brought tears of joy to even his most ardent critics. Maybe Dwight will be fine, but I don’t think fine is good enough against these Warriors.